Western Connecticut is sprinkled with pretty glacial lakes. 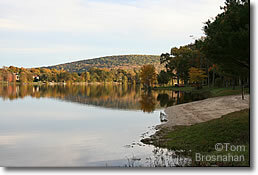 Lake Waramaug, near New Preston, is the prettiest, with fine inns, a vineyard and a state park on its shores. Named for an Indian chief of the Wyantenock people, Lake Waramaug is a fine destination for a swim, a picnic stop, a day's outing, or even an overnight in a tent or an inn—especially in foliage season, when its trees are ablaze with color. To stay overnight here in summer, you've got to plan your visit and make reservations for accommodations, as they are relatively few, and fill early. The drive around the lake can be done in less than an hour if you don't stop—but stopping is the whole point! Stop for a meal, afternoon tea, a drink or overnight at one of the inns (Hopkins Inn, Lakeview Inn, or The Boulders). Taste some of the wines made from French-American hybrid grapes at the Hopkins Vineyard on Hopkins Road in Warren CT.
Stop for sure at 95-acre (38-hectare) Lake Waramaug State Park for a swim, a picnic, some lake fishing, or a snooze on the grassy lawns. If you want to camp, you must reserve one of the 88 good lakeside tent campsites in advance. If you don't find a campsite available here, you can try at Housatonic Meadows State Park, two miles (3 km) north in Cornwall Bridge/Sharon; or Macedonia Brook State Park in Kent. Kent Falls State Park and Mount Tom State Park are also near, and offer fishing, hiking and picnicking, but no camping. North on CT Route 45 is the town of Cornwall Bridge, named for its pretty old-fashioned red covered bridge, with a stop and a photo.